Counsilman-Hunsaker, in association with Cochran, Stephenson and Donkervoet Architects, and Sasaki, designed a new natatorium for the 167,000 sq. ft. Physical Education Complex (PEC) at Coppin State University. 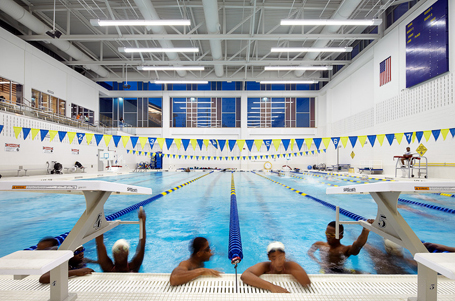 The natatorium, which features an indoor eight lane 25-yard pool with 100 spectator seats, was part of the comprehensive school expansion project, thus expanding the 52-acre campus by approximately one-third. In addition to the natatorium, the PEC also houses a 4,100-seat basketball arena, fitness center, auxiliary gymnasium, dance studios, multi-purpose space, racquetball courts, and classrooms. Upon completion, PEC will be pursuing Leadership in Energy and Environmental Design (LEED) certification.